Play the Cauldron Connector game! June Kinoshita on Play the Cauldron Connector game! Flash Games on Play the Cauldron Connector game! June Kinoshita on Come stir the pot! Michael Glenn Williams on Come stir the pot! Posted on August 6, 2013 Author June KinoshitaCategories NewsTags arts festivals, interactive art, music composition, New Music, Press, Summer 2013Leave a comment on Three weeks to go! 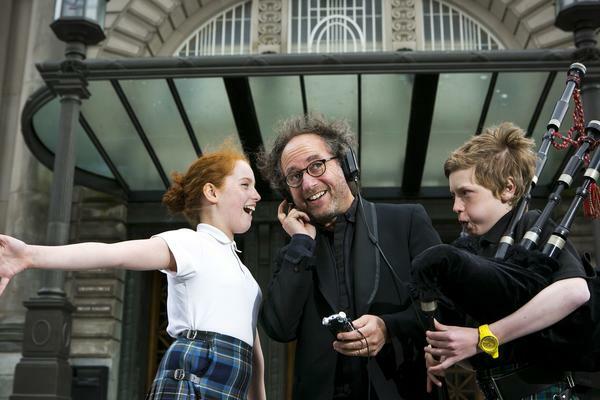 Tod Machover was in Edinburgh last week meeting with various musical groups. Pictured with him is a female student from the Gaelic choir and a boy from the teenage bagpipe ensemble. Machover worked with both groups to listen to and then experiment with their sounds. The Constellation and Cauldron apps are now live! You can start creating your own scores for Festival City. With the brand new Cauldron app (designed by Akito Van Troyer and Tod Machover at the MIT Media Lab), you’ll be able to create and experience a bubbling brew of Edinburgh sounds that have been concocted and collected for Tod Machover’s Festival City , currently being composed by Tod – with your collaboration – for the 2013 Edinburgh International Festival. Starting now, you can experiment with our first selection of musical and audio ingredients to stir up your own special mix. We will be adding new features and sounds quite regularly over the coming weeks, so please visit the app often. Each time you’ll find something new to add to the Cauldron and will experience new ways that the elements blend, bubble, and surprise. Click here to play with the Constellation and Cauldron apps! Posted on June 7, 2013 January 19, 2016 Author June KinoshitaCategories Things to doTags artistic collaboration, arts festivals, experimental music, music composition, Summer 20133 Comments on Come stir the pot! Join the Festival City digital media campaign! Join the Festival City Facebook events page. Then invite your friends to join! Follow the project on Twitter @ComposerCity and @Edintfest. 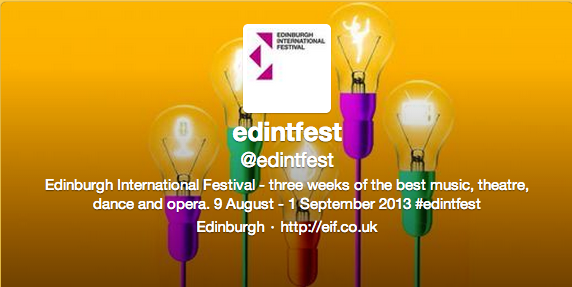 Use #Edintfestcity to tag tweets related to the project. Posted on May 14, 2013 January 19, 2016 Author June KinoshitaCategories Things to doTags artistic collaboration, arts festivals, music composition, Orchestras, Summer 2013Leave a comment on Join the Festival City digital media campaign! Get started! Send in your sounds of Edinburgh! What is the first sound you hear in the morning? What is your favourite Festival memory? What does your street sound like? Do you regularly pass a busker? Do you enjoy the sound of crowded foyers or standing ovations? Climb Arthur’s Seat or take a trip down Portobello Prom? We are inviting people to record or describe these sounds and to send them in to provide composer Tod Machover with the basis of a creative work which he will then continue to develop through to the beginning of July. If you have a smartphone, all you have to do is capture the sound and upload them to Soundcloud and add it to the Festival’s Soundcloud account. It will show up in the player below. Invite your friends to comment, and start a conversation! Details here. Posted on March 19, 2013 January 19, 2016 Author June KinoshitaCategories Listen, Things to doTags arts festivals, experimental music, Media Lab, New Music, Orchestras, Summer 2013Leave a comment on Get started! Send in your sounds of Edinburgh!